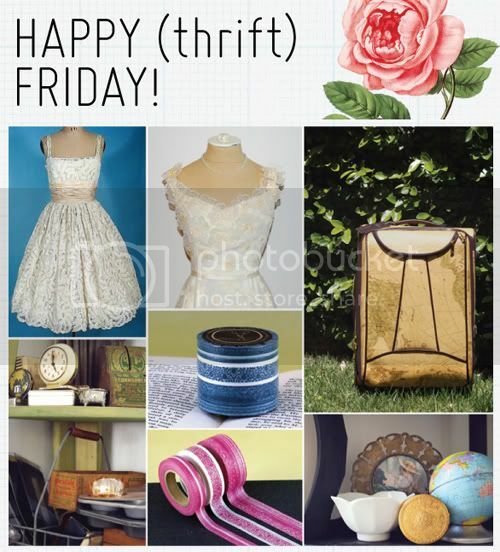 Happy thrift Friday friends! I've been gathering things all week to get ready for the vintage yard sale this Sunday. Really excited to meet new friends! Thought I'd share some pictures of the bigger items that I have - a couple wedding dresses if anyone is looking for a vintage wedding dress. I'll probably list them online! (They are priced at $1,000 each) I have a cool map suitcase if anyone is interested in that, great for travel. Lots of washi tape packs or singles. I'll definitely try to list some things next week for anyone missing out or who just don't live around the area. Do you have anything planned for the weekend? I got an email for tickets to Ty Pennington's new show, Greatest American Auction, which I guess is all about (what do we all love?) antiques! So Nick and I are going to that tomorrow in Long Beach. It's being taped at The Queen Mary! We're heading to church after that and then Sunday is our yard sale. Here's to friends finding new treasures and hopefully clearing some space in my own place. Wishing you all a fun and happy weekend! xo. I just want to say that I am v impressed you have the will power to give such pretty things away! It's a super great idea to do a roundup of the comments from that post! I am definitely looking forward to reading that. It's really nice to hear good solid discussion! :D I think it's helpful knowledge to all of us in our lovely little blogging community and help us to understand each other better. That sounds like a fantastic weekend! I would love to come up and check out the sale you and Lillian are having but I won't be able to get up into your area for another two weekends it looks like. Have a great time, Danni! ahh i wish i could be there for your yard sale!!! i'm just down the freeway from brea! but i've got way too many things to do on sunday it's not even funny! haha have a great time though! I'm actually tempted to fly over to America just to go to this yard sale... So many pretty things! Ahhh I hope your yard sale will be a success, though I am sure it will be. :) Sounds like you have got some REALLY cool things, especially the wedding dresses and the map suitcase. <3 Hope you have a wonderful weekend. Wonderful items and oh how I wished I lived close to check all of these out. Sounds like you have a fun and interesting weekend planned. Good luck with your sale and thanks for sharing. We finished grouting my new bathroom, I made a fancy birthday cake for the mom in law, and we are chilling this weekend, love weekends like this! in L.O.V.E with that first dress!! Oh, the first dress is so lovely. love thrift shopping - looks like you have some great items! I'm seriously in DIRE need of a suitcase considering I'm going to Europe with my sister soon. If this will be listed online, I would LOVE it.